Early this morning we drove out of Jerusalem past Ein Karem and Sataf and followed the Soreq valley, the historical route of the train that joined Jaffa to Jerusalem. Suddenly the gauge on the car signaled that the temperature outside was 4ºC. As we looked to the right the valley was filled with mist. We pulled off the highway, parked and climbed the hill to get some elevation and take photographs. Then we descended into the valley and mist and got some nice closeups using a macro lens. Couldn’t find any spiders but saw their gossamer webs left behind. We did a nice hike in Nahal Katlav, from the derelict Bar Giora/Dayr-al-Shaykh train station, and I figured that the time was right to find crocus pushing up through the earth and we did. This entry was posted in Hiking, Jerusalem, Nature, Photography, Wildflowers and tagged crocus, family hike, Hiking on December 24, 2015 by Shmuel Browns. Even from space Makhtesh Ramon appears as a masterpiece of the spirit of the earth. This week I did a very nice 13 km hike in the Har HaNegev reserve to Har Ramon, the highest mountain in the Negev at 1037 meters above sea level. After the winter rains we saw many plants blooming even though this area is a desert. Along the way we passed a number of tumuli, piles of rocks that are ancient tombs, and a 4.6 km stone wall running between the mountains Ramon and Romem estimated to be from the Intermediate Bronze period, more than 4000 years ago. 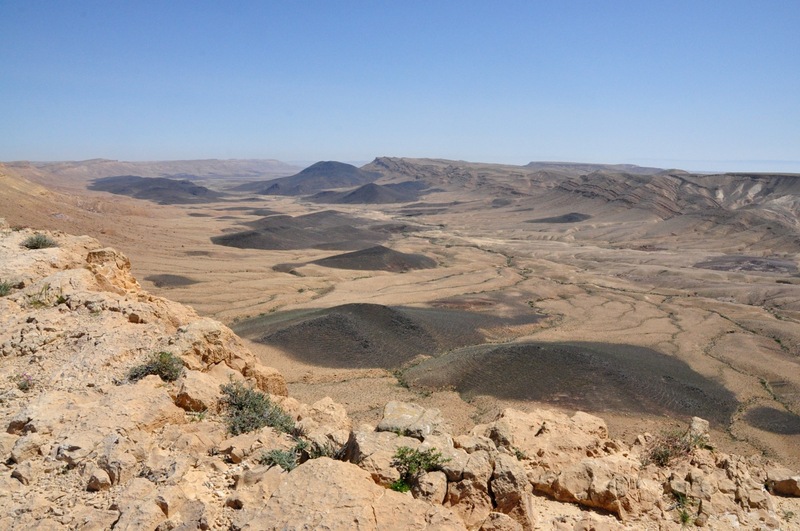 Further along the red trail we reached a lookout on the basalt hills of Karne Ramon below, where a monument has been established to the 7-person crew of the space shuttle Columbia that disintegrated on re-entry into the Earth’s atmosphere in 2003. One of the crew was Israeli, Ilan Ramon, who had taken his surname from this area. From there we descended in a winding path to Nahal Ramon at the bottom of the makhtesh. We then joined the green trail through the Canyon of Prisms and ascended the trail out of the makhtesh. It’s hard to capture the expansiveness of this “hole” in the earth because the makhtesh is so large. The makhtesh is 40 km long, 2–10 km wide and 500 meters deep, and is shaped like an elongated heart. I took a sequence of overlapping photographs with the intention of stitching them together to try to give you an idea of the view. Click on each of these images to see it full-size. The image below is made up of 2 photos “stitched” together. This image is made up of 3 photos. 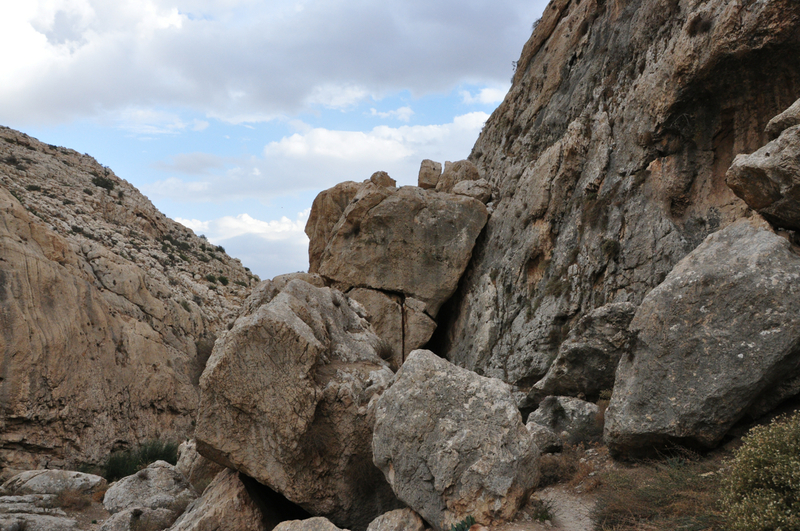 This image is made up of 4 photos, a pan of 180º, overlooking Karne Ramon at the southern end of the makhtesh. 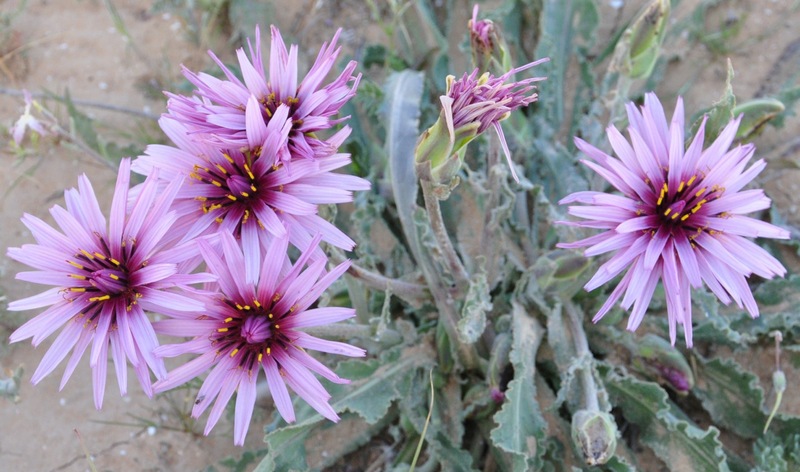 This entry was posted in Desert, Hiking, Nature, Photography, Wildflowers and tagged hike, Hiking, makhtesh, Negev, panorama on April 1, 2014 by Shmuel Browns. Nahal Prat (nahal: נחל=stream bed) or Wadi Qelt (wadi: وادي‎=valley) flows from west to east across the northern Judean Desert, from near Jerusalem to Jericho, a distance of 28 km, from 770 meters above sea level to where it flows into the Jordan River at 395 m below sea level. 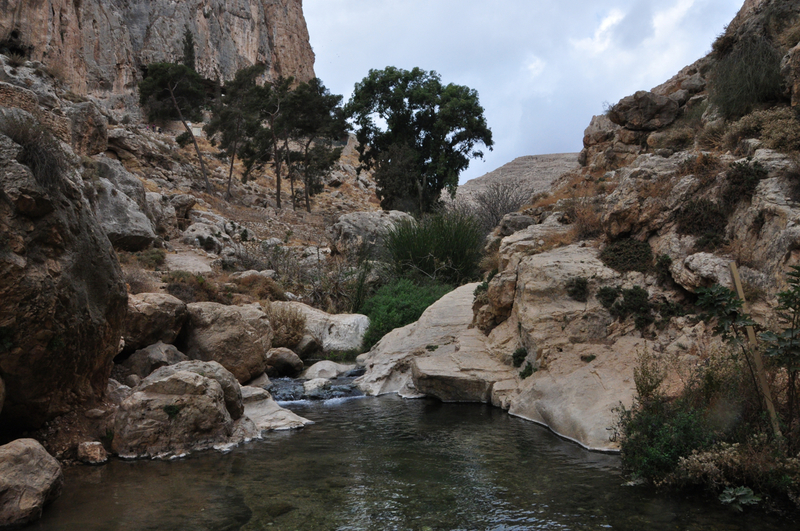 Hiking trails follow the stream bed, which has water all year around fed by three springs, En Prat, En Mabu’a and En Qelt. 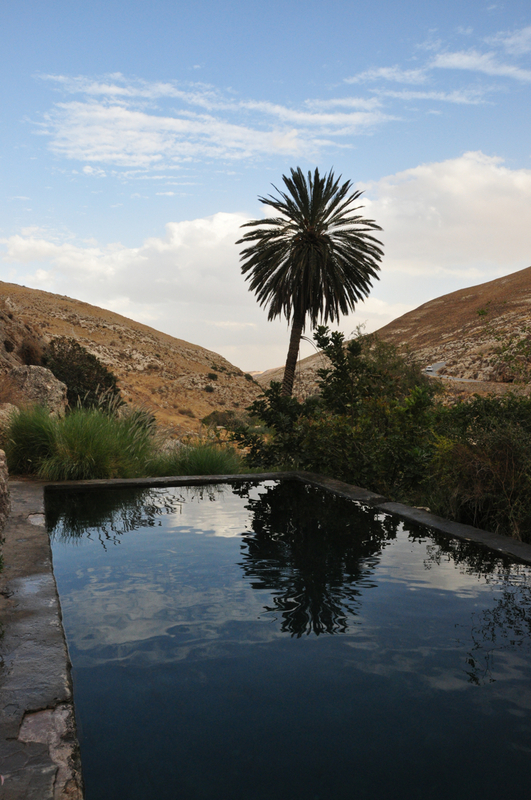 My blog post about Wadi Qelt and the St. George Monastery is one of my most popular so I want to tell you about another destination in the area, the Nahal Prat nature reserve. Take highway 1 from Jerusalem towards the Dead Sea and then a left onto road 437 towards Ramallah. Turn right to the Jewish settlement of Anatot (the Levite city mentioned in Jeremiah 1:1), now called Almon (from Joshua 21:18). 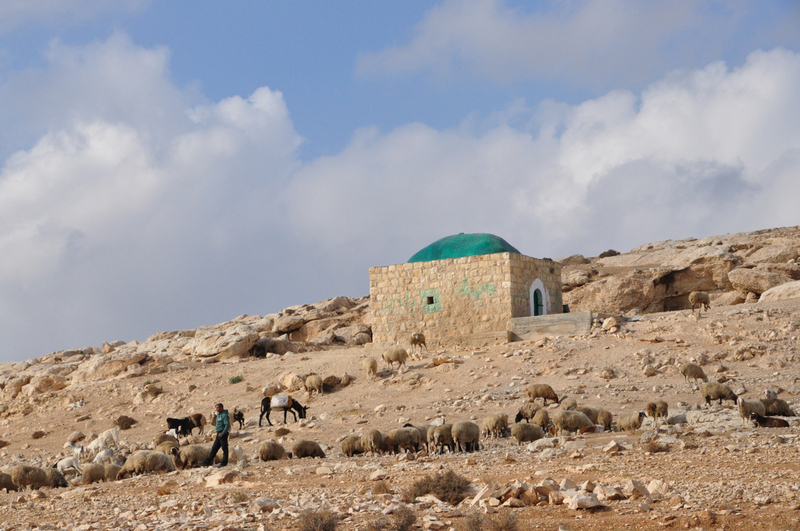 Ruins of the Jewish Iron age village, time of Kings is at the turning, with the 13th century Arab tomb of Sheikh Ibn Taymiyya (תָקִי אל-דין אבו אל-עבאס אחמד בן עבד אל-חלים בן עבד אל סָלאם בן תימיה אל-חָרַאנִי) on the hill. Drive through Almon to the entrance of the reserve and descend the winding road to a parking lot. I took these photographs of En Prat, the valley formed by the steep limestone cliffs and the pools within the reserve. The remnants of settlements, monasteries and palaces are scattered along the stream, as are signs of stream-based cultivation. A number of aqueducts were found along the stream, the earliest of which dates to the Hasmonean period, used to channel water to the winter palaces near Jericho. These channels continued to be used through the Roman, Byzantine and early Arab periods. This enabled the growing of fruit trees like fig, pomegranate, date and citrus. 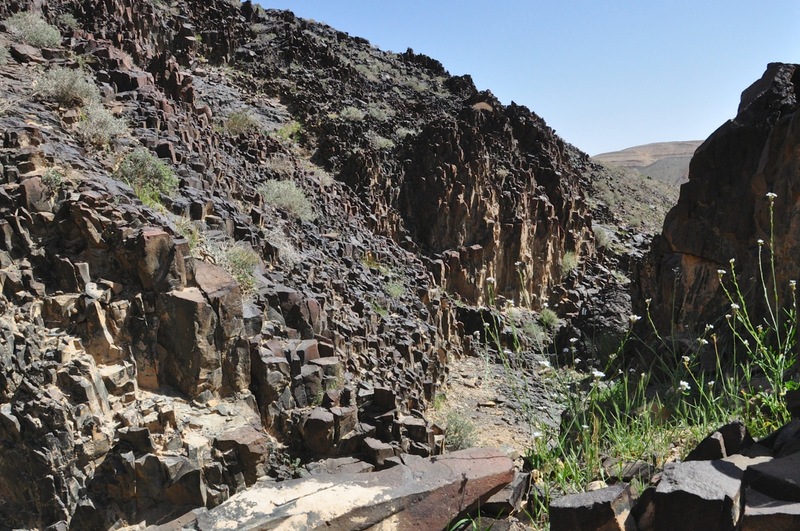 Ruins of a later water-operated flour mill can be seen on the ascent to the Faran Monastery, originally founded by the monk Haritoun in the 3rd century, believed to be the first monastery in the Judean Desert. This area, in the desert and not far from the holy city of Jerusalem, with many natural caves, springs and abandoned Second Temple period fortresses, attracted monks seeking seclusion. Today, for the same reasons, the area is a popular recreation site to hike, picnic and swim in the natural pools. 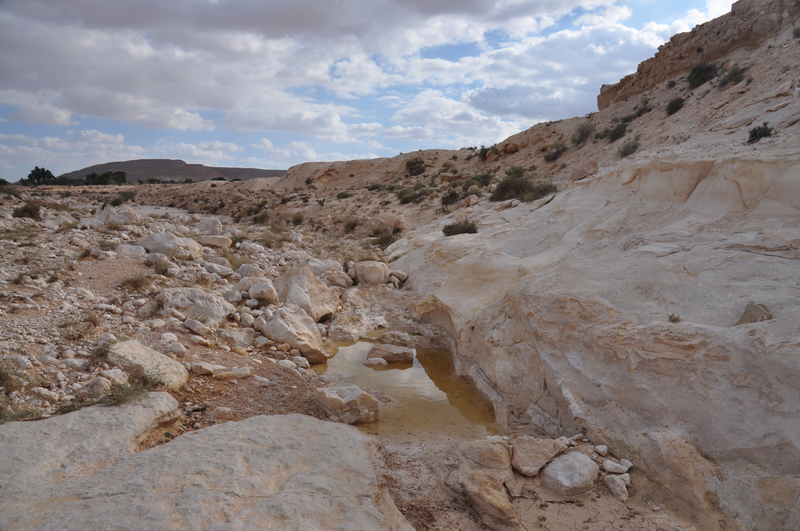 This entry was posted in Archaeology, Hiking, Nature, Photography, Water and tagged Haritoun, Hiking, Judean desert, monastery, swimming, Wadi Qelt on December 17, 2013 by Shmuel Browns. 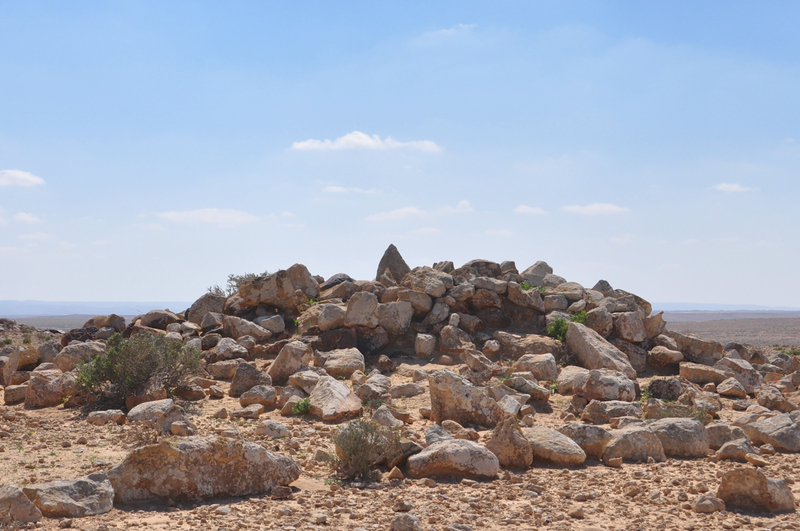 In a hike in the Negev, in the area of Mount Arkov (across the road from Avdat) to see the rock drawings and tulips in bloom, I took this photo of a tumulus, a mound of stones raised over a grave. The tumulus and rock drawings or petroglyphs may be from early hunter-gatherers, dated to the fourth millennium BCE. The technical details – the photo was taken with a Nikon D90 DSLR and 18-200mm lens in November (ISO 200, 36mm, F11 at 1/500 sec). This entry was posted in Desert, Nature, Photography and tagged desert, Hiking, ibex, Incense Route, Israel photo, Nabatean, Negev, petroglyphs, photo of week, Photography, rock drawings, tulip on March 10, 2013 by Shmuel Browns. The Golan Trail is a 125km trail from Mount Hermon to the Sea of Galilee. 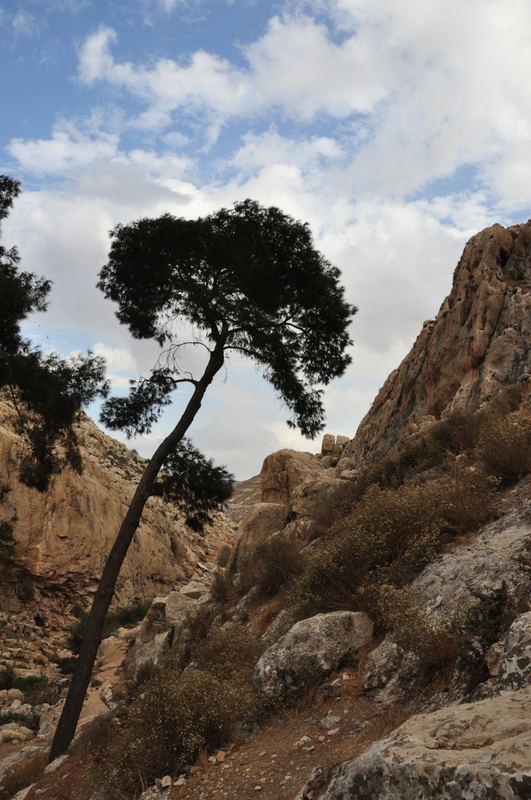 This photo was taken while hiking the trail near Alonei HaBashan. The technical details – the photo was taken with a Nikon D90 DSLR and 18-70mm lens in April (ISO 250, 70mm, F10 at 1/250 sec). 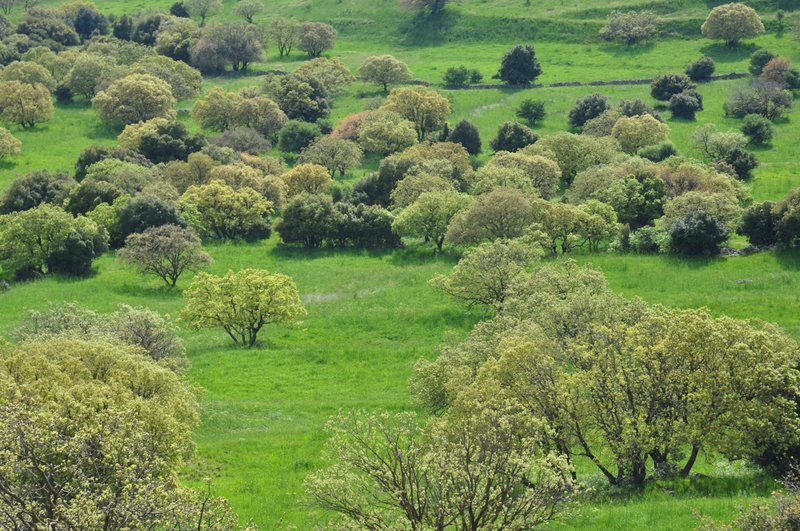 This entry was posted in Nature, Photography and tagged Golan, Hiking, Israel photo, photo of week, Photography on February 10, 2013 by Shmuel Browns. 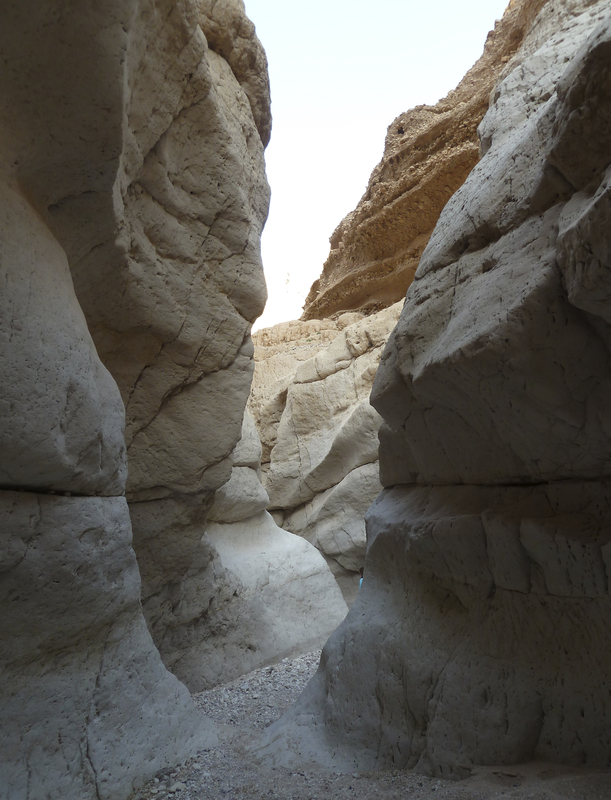 A limestone canyon formed by water erosion over many years beckons – Nahal Darga runs to the Dead Sea. Water fills depressions in the stone floor of the canyon so there are places on this hike where you have to swim across pools of water. Make sure to put your camera (I brought along a smaller one on this hike), car key and cell phone in a watertight container so they won’t get wet. The technical details – the photo was taken with a Lumix (point and shoot) digital camera on March 26 (ISO 80, 4.1mm, F3.5 at 1/100 sec). This entry was posted in Desert, Hiking, Nature, Photography, Water and tagged desert hike, Hiking, Israel photo, nature, photo of week, Photography on February 3, 2013 by Shmuel Browns. Route <40> connects the city of Beersheva in the middle of the Negev to the makhtesh, a unique geological formation at Mitzpe Ramon. Avdat, founded by the Nabateans in the 3rd century BCE, was the most important city on the Incense Route after Petra, “the rose-red city half as old as time” for some eight centuries until its destruction by earthquake in the early 7th century CE. This photo was taken across from Avdat in the area of Ramilye cisterns. The technical details – the photo was taken with a Nikon D90 DSLR and 18-70mm lens in November (ISO 200, 18mm, F10 at 1/320 sec). This entry was posted in Desert, Nature, Photography, Water and tagged Beersheba, desert, desert photographs, Hiking, Incense Route, Israel photo, Mitzpe Ramon, nabateans, Negev, photo of week, Photography on December 23, 2012 by Shmuel Browns.